The 4 line wrasse comes from Hawaii and isn’t as available as the 6 line wrasse. 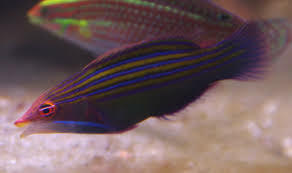 It’s not as aggressive as the 6 line wrasse, and is actually slightly small. You need to be careful when mixing it with other wrasse and basslet. Needs a secure top as it’s a jumper.